So where to begin this month? Short days and chilly nights mean we all crave comfort foods but after the excesses of the Christmas period, budgets are tight and healthier menus are on everyone’s minds. So it’s time to go minimal in the kitchen and enjoy simple clean dishes that satisfy. The brassica family neatly fits the bill. Kale, Savoy cabbage, sprouts and spring greens are all full of flavour now and don’t need to be boiled to death. In fact they work perfectly in stir fries, hearty soups and curries, or serve them simply shredded and steamed tossed with a little seasoning, and a dash of cold pressed rapeseed oil. Mark Twain called cauliflower ‘cabbage with a college education’ and it certainly is a vegetable that deserves more than just a cheesy sauce. Try it in soups, fritters, or steamed then quickly fried with olive oil, anchovies, garlic and chilli for a quick sauce for pasta. Main crop potatoes, Jerusalem artichokes, parsnips, celeriac, swede and turnips provide the starch that keeps us going in the cold so mash them together to go with your meat dishes. Lemon sole, halibut, skate and turbot are all good at this time of year – try them simply cooked on a griddle with a little oil to prevent sticking and a squeeze of lemon juice. Then sit back and appreciate really great fish at its very best. Shellfish fans should keep an eye out for clams, mussels, oysters and cockles. Try mussels cooked with a creamy lightly curried sauce as a change from the more classic moules marinieres. For meat eaters, game is an excellent choice for seasonal healthy eating. Venison is plentiful now and, with its lean flesh and high mineral content, is great for those watching waistlines. Game merchants are increasingly specifying which breed of deer they are selling and as with beef it helps to know which one you are eating – fallow, roe, red deer or muntjac all have their own particular characteristics. The feathered game season comes to a close around the end of the month so now is a good time to use wild duck or pheasant in a casserole or pie. Game dealers should sell game mixes that also are marvelous as a filling for a pasty. Another hearty meat to use this month in braises and casseroles is mutton, perfect in a rich stew or tajine. 1 Place the pheasants in a large pan that fits them neatly with the stock vegetables. Pour over enough cold water to almost cover and a large pinch of salt. Bring to the boil and then cover and simmer very gently for 30 – 35 minutes until the juices run clear when the thickest part of the leg is pierced with a skewer. Cool the birds in the stock for a really good moist finish. Strain the stock and measure out 600ml. Keep the remaining stock for soups or risottos. 2 Preheat the oven to 200C gas mark 6. Remove the pheasant meat from the bones, discarding the skin. 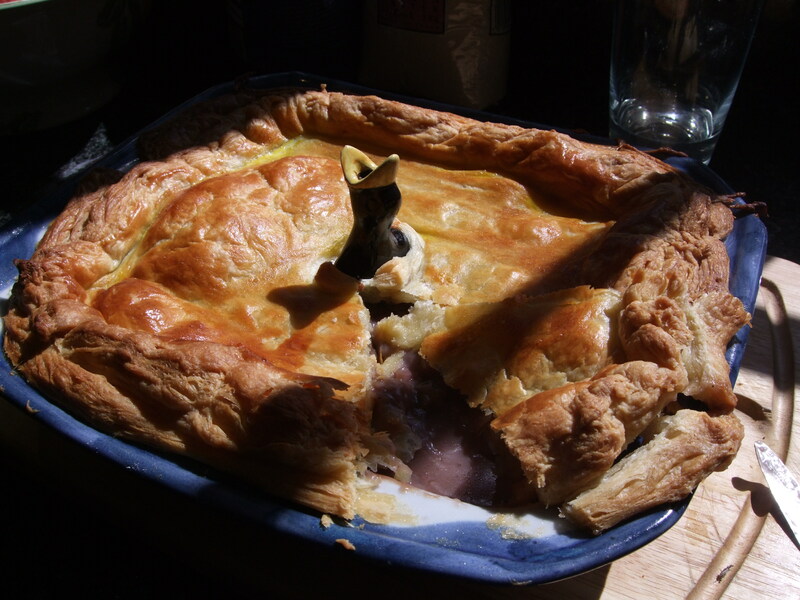 Tear into pieces and place in a 2 litre pie dish or roasting tin with a wide lip to hold the pastry. Melt half the butter in a large non-stick pan and add the onion and chestnuts. Fry for 3-4 minutes until soft and pale then add to the pheasant in the dish. 3 Melt the remaining butter in the pan and add the flour. Stir for a minute to cook out the flour. Off the heat gradually whisk in the reserved stock and wine then return to the heat and simmer, stirring until thickened and smooth. Stir in the orange rind and juice, cranberry sauce and season to taste. Pour the sauce over the meat in the pie dish to cover and leave to cool. Place an eggcup or funnel in the centre to support the pastry. You can make the pie up to this stage then cover and chill overnight. 4 Roll out the pastry on a lightly floured work surface to a rectangle 5cm larger than the dish. Cut a strip of pastry about 1.5cm wide and place along the edge of the pie dish. Brush the pastry edge on the dish with cold water then lift the pastry over and settle it gently over the filling. Pinch around the edges to seal and make a hole in the centre to allow steam to escape. Chill for 15 minutes to allow the pastry to rest. 4 Brush the pastry top with beaten egg to glaze and bake in the preheated oven for 45 -50 minutes until the pie crust is crisp and golden. Serve with mashed root vegetables and steamed shredded cabbage. 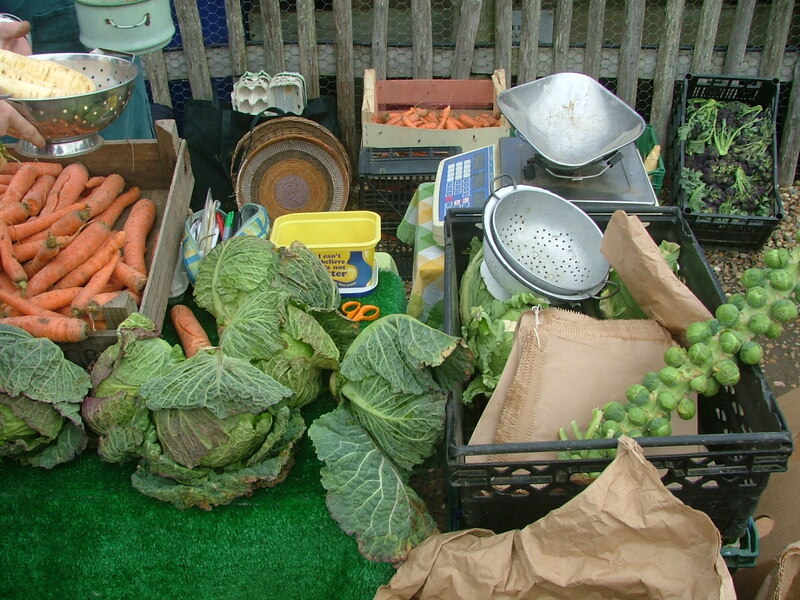 This entry was posted in Farmers Market, In season, Local food and tagged Farmers’ market, game recipes, in season, local food, Penshurst farmers market, pheasant pie, recipes. Bookmark the permalink.